This Spring, we’re steering away from florals and moving into metallics! I know, not exactly the seasonal trend we are used to this time of year, but it’s such a hot trend right now. So, put those pastels on pause and opt for something shiny and new! Here are five key pieces to kick-off your metallic-inspired wardrobe. Let’s go! Phone Case – Arguably one of our most important accessories because we always have our cell phones on us. Phone cases are a great way to show off your personality and add some fun! I am definitely more into cutesy cases, but I like this rose gold metallic case from Forever 21 when I want something more sophisticated and chic. Two words that describe me right? LOL. But a phone case is a super easy way to have fun with this trend! Jacket – Now, I LOVE a good metallic jacket! If you’re someone that doesn’t like to accessorize too much, then a statement piece like this will be your best bet. This metallic pink moto jacket will be all the accessory you need! Not only is it a great color for Spring and Summer, but you can also make it work for Winter parties as well. I sure do love a versatile piece! Shoes – Well these babies have been a staple of mine for a while and I literally wear them all of the time. I love my Steve Madden rosegold slides because they are super comfortable and honestly match everything. Shorts, pants, skirts, dresses, you name it! These sandals look great with so many looks. Makeup – Metallics have made their way into so many cosmetics recently from highlighters to lipsticks, to eyeshadows, nail polishes and MORE. I don’t know if I am daring enough to try all of these products, but I do think a fun metallic lip is an easy way-to-go to get started with this vibrant trend. The Smashbox metallic liquid lipsticks are seriously SO beautiful. The way the pigment glistens and reflects in the light- it’s mesmerizing! Dress – Now, if you’re ready to really give this trend a try, go big or go home with a metallic mini dress! All eyes will be on you as you shine everywhere you go. A gold metallic dress like this one from For Love & Lemons is definitely not made for the subtle! Handbag – A metallic clutch, small handbag or backpack are such fun ways to show off this trend this season. Just like a cellphone case, we take our bags pretty much everywhere with us, making it a critical accessory in our wardrobe. I personally do not have a lot of patience for changing my bag every day to match my outfit, so finding a metallic that can be neutral to any colors or prints I’m wearing is key! 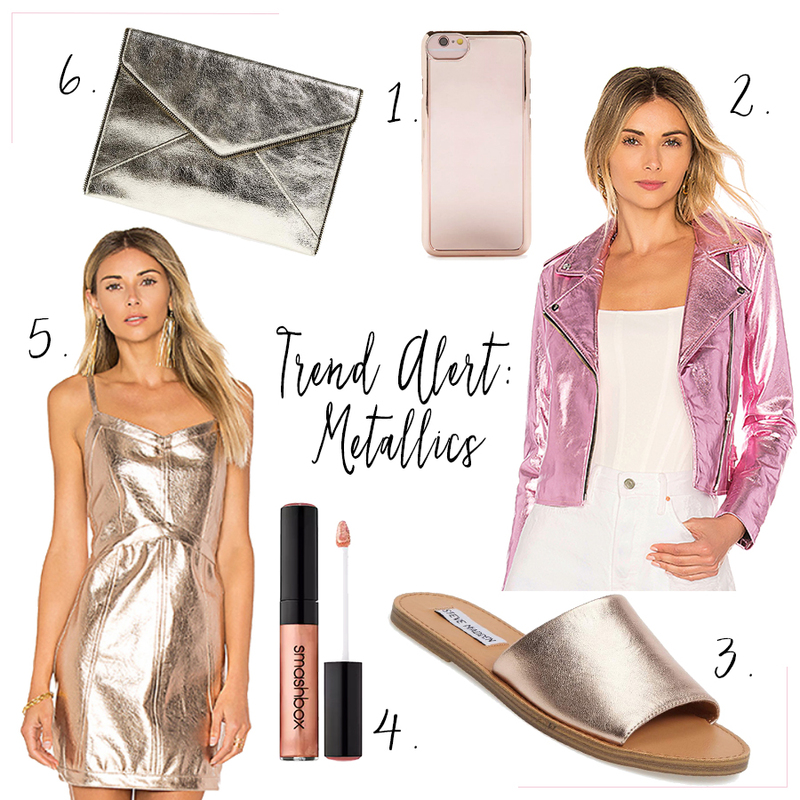 So there are some fun new ways to try out the Metallic trend! And just like any trend that comes along in fashion, you really have to make it your own. If you don’t feel comfortable in a full-blown metallic dress, try something simple like a clutch or piece of jewelry. Just have FUN! My girlfriend likes metallic moments too — will share this post with her — thank you!